Dorris the Flip Flop Gardener is a humorous, illustrated gardening blog designed to provide Texas gardeners with fun, useful gardening tips. Dorris is a third generation Texas gardener who skips over the mumbo jumbo of formal gardening advice and gets right to the heart of how to grow things in Texas. 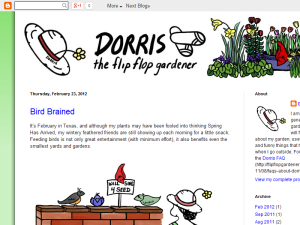 This what your Dorris the Flip Flop Gardener Blog Ad will look like to visitors! Of course you will want to use keywords and ad targeting to get the most out of your ad campaign! So purchase an ad space today before there all gone! If you are the owner of Dorris the Flip Flop Gardener, or someone who enjoys this blog why not upgrade it to a Featured Listing or Permanent Listing?